Learn how to structure your lesson using easy-to-navigate sections and blocks. You can break up the content of your lesson into sections. Sections are a way to bring structure to your lesson’s content. Each section gets its own navigation on the left side. 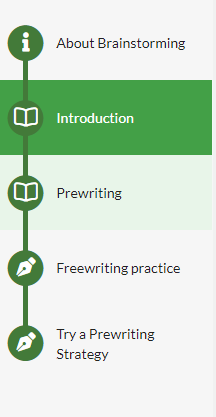 A lesson will have an 'About' section ("i" icon), and can have multiple content sections, such as readings and lectures, (book icon) and writing or annotation assignments (pen icon). Content sections can have text, readings, videos, audio, and images. These sections can include discussion questions built right in. Go to your lesson from the 'Class Home' or the 'Lessons' tab by clicking on the tab. Once there you will be in 'Edit Mode' if the class is 'not running.' If the class is 'Running' you'll need to click 'Edit Mode' in the upper left to make changes. Once there you will be able to add sections using the two button on the left: 'Add Section' and 'Add Assignment'. When 'Add Section' is clicked, you'll be asked to add a section title. When 'Add Assignment is clicked, it will open a prompt to choose assignment types, add assignment details, critique settings, etc.